Bonita Springs Real Estate - “Small Town Charm Big Bright Future” – this town’s motto couldn’t be more apt. The city of Bonita Springs is comfortably nestled between more upscale Naples and more populous Fort Myers and charms inhabitants with the feel of a relaxed beach town. The city has the appeal of metropolitan suburbs with an elevated standard for amenities and primarily catered towards retirees or vacationers, though it is not exclusive to those two demographics. A lot of businesspeople decide to move their businesses to their retirement home to take advantage of Bonita Springs’ high-quality-low-cost commercial spaces and low taxes for businesses. Bonita Springs has a casual and easygoing atmosphere compared to more hustle-and-bustle major cities like New York or Los Angeles, making it a great escape to a quieter life, even if only part-time. This city has a long and interesting history dating back to the 1870’s when it was initially known as Survey. Homesteaders planted their roots and eventually a Post Office was opened in 1901. It was decided that the placeholder name of Survey just didn’t suit the idyllic surroundings; that they needed a name more fitting to the spirit of the area and thus, Bonita Springs was born. Bonita Springs remained a small and quiet town despite the construction of local attractions until the advent of common air conditioning. Southwest Florida International Airport opened shortly thereafter, as well as I-75 and a new US-41 bypass. Despite all of these new constructions, Bonita Springs never truly lost its initial spirit of a quiet, calm piece of paradise away from the hustle and bustle of modern life. Following along with the Post-WW2 trend of “Sister Cities” or “Twin Cities”, Bonita Springs became the Sister City to Grünstadt, a town in Western Germany in 1991, opening itself up to the international community. To this day, many visitors and immigrants from Germany find a second home in this area. Ample natural beauty abounds in in and around Bonita Springs. Barefoot Beach was even ranked #6 on Forbes‘ list of best beaches in the whole United States. Such beauty commonly comes at a great cost, but this is not always the case. Bonita Springs hosts modestly-priced homes and condominium buildings with lively golfing communities dotting the quieter inland areas. There are a multitude of freshwater lakes and twinkling waterways snaking their way through Bonita Springs, most notably the Imperial River cutting its way through the city, making this the ideal living space for boaters, kayakers, fishers, hikers, and more. With all these wet areas, you can bet there is amazing seafood to go along with it. The seafood in this area is held in high regard by many in the area and you can’t get much fresher than straight from the water and into the kitchen. The wind coming off the gulf blows gently between the tropical trees, carrying the scent of flowering plants through the streets just about anywhere in town. Popular attractions in Bonita Springs run the gamut of lifestyles. From things as oddball as Bonita Springs’ own Disc Golf Course – a traditional golf course but with frisbees – to more conventional like the ever-popular Barefoot Beach Preserve Park and 10 beach access points with public parking located along Bonita Beach. It is also home to the venerable Everglades Wonder Garden – a lush botanical garden with tropical birds and reptiles that was established in 1936 during Florida’s Golden Age of roadside attractions. Bonita Springs Recreation Center lies just behind the Public Library and Community Pool and features Bonita Springs’ own Skate Park, attended at all times for safety. There is also the Dog Beach park with privately-provided doggie showers to keep your car clean after a day at the beach with your pooch. Speaking of dogs, ever-popular is the Naples-Fort Myers Greyhound Track located on the southern side of town. Bonita Springs is also the home to a thriving art scene. The Art League of Bonita Springs is an arts organization that hosts a number of events on a regular basis. Various types of art classes for the aspiring artist or the veteran looking to hone their skills – you can never learn too much! Additionally, traveling art exhibitions make a stop in this area and just south in Naples alongside the numerous exhibitions of art created by local artists. The population of this city has been in a calm state of flux but has grown slightly since the early 2000’s and currently averages around a population of forty-to-fifty thousand. Many residential areas were styled after Old Florida designs, but this city is a great fit for a wide variety of lifestyles and needs for people. 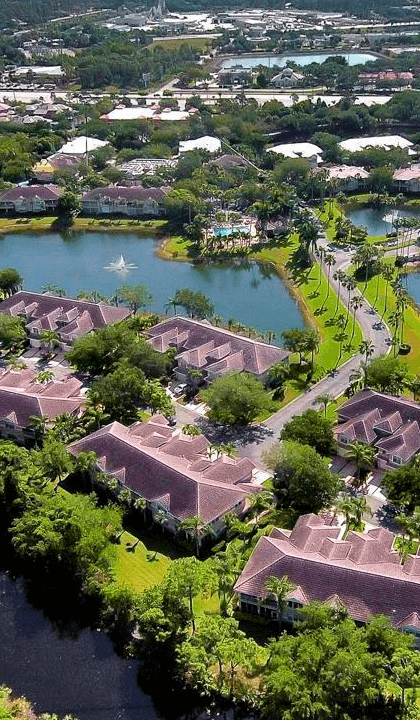 The communities of Bonita Springs offer diverse amenities for the resident with an active lifestyle. These include, but are not limited to, tennis courts, basketball courts, shuffleboard, resort-style swimming pools, lap-pools, general fitness centers and workout rooms, boating opportunities, fishing docks, private beach access, exclusive golf courses and so much more. Isn’t it time to take a closer look at this gem?